We offer a wide variety of Corvette performance services, whether you want a daily driven bolt-ons car or a 1000+ RWHP turbo monster, we can get you where you want to be. We also have a turn-key package called the ZX; it is for LS6 Z06s only. It is a guaranteed 400 RWHP for only $4,000. Here are a few examples of Corvette customers and their experiences with us. Robert came to Speed Engineering after being referred to us by a good friend who we have also done work for. He wanted us to install a P-1SC Supercharger kit from A&A Corvette and a set of headers. We recommended a set of Kooks. With only 7,000 miles on the odometer, his bone stock base line dyno was 289.5 RWHP & 302.2 RWTQ. With only the Kooks 1&7/8" headers and Speed Engineering tuning, the car made 340.5 RWHP & 357.1 RWTQ! That's over a 50 RWHP and 50 RWTQ gain, not to mention that the rest of the car was bone stock, including the air box, filter, and mufflers -- proof that Kooks headers are the most powerful LS1/6 headers available. With this done, we moved on to the supercharger. The kit was the entry level version with a P-1SC Procharger. 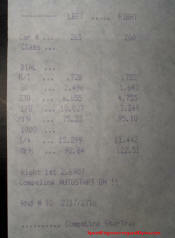 When everything was said and done, Mr. Plaster's car put down 554 RWHP and 496.9 RWTQ. That's REAL wheel horsepower. Heath has had some bad luck with his car. When he first decided to modify the car, he took it to another shop to get the work done. Unfortunately, his car left there with nowhere near the potential of the heads and cam choice he went with, and he knew it. He then decided to come to Speed Engineering for a Dyno Tune. When Heath first brought his car in it put down 399.8 RWHP and 391.0 RWTQ on our DynoJet. After we were finished tuning, we managed to get 429.5 RWHP and 418.3 RWTQ out of it. That's 29 RWHP over the previous tune by another shop. All that just because we maximized the car's ability to the fullest. Phillip's Corvette is the most impressive C3 in town. His car has an internally stock LT1 engine that we installed and tuned. His car, with a 150 shot of TNT, went 6.84 in the 1/8 mile at 99.29 MPH with a 1.65 60ft. The owner of Speed Engineering, Jeff Nance, has had his Corvette for several years. It has been feared on the streets of Cleveland since he bought it. It has a custom Speed Engineering mild LT1 heads and cam package that makes 394 RWHP, 383 RWTQ. Plus it can pass emissions, get 31 mpg with a 3.45 gear, and be a friendly daily driver, all in spite of the speed density challenges that governed all the tuning. Tyler, an Industrial Engineer from Florida, contacted us wanting a mild bolt on package for his daily driven Corvette. We used very few select bolt-ons that work perfectly together with the tuning to achieve a 12.33 1/4 mile on factory 18" Goodyear tires. Plus, everything done so far makes a solid base for future mods. His car is exactly what he asked for --a no compromises budget combination that drives better than stock and is emissions legal. This P1SC Procharged Vette is amazingly stock with only forged pistons, a stealth cam, and tuning. A dream to drive, this car never gives any indication of having 427.9 RWHP and 458.0 RWTQ. That is until you press the "quiet" pedal to unleash all this power through the completely stock exhaust. This car can also pass the tough Atlanta emissions testing. Check out all that Torque! Chip's car is the original X Package test car, we achieved 400 RWHP with bolt-ons only on his LS6 in 2001. His car paved the way for our LS1 X Package. His car ran 11.44 @ 122 in the 1/4 mile which some heads and cam Z06s were not running at that time. To learn more about this package check out the X-Package page. Thank you for visiting Speed Engineering and Dyno's Corvette Customers Section. We hope this site will help to show you what we can offer for your late model car or truck. We offer many different services ranging from tune-ups to full performance engine builds. If you want the best service and tuning possible, then give us a call or send an e-mail. We will be more than happy to get you a quote on any part or talk with you about a full package. No matter what, Speed Engineering can meet your needs. Whether it is an aftermarket cold air intake, a Speed Engineering custom built 4" cat-back exhaust, a 400 RWHP bolt-on only X-Package, or a 427+ cubic inch blown monster. You have found the right place!